Suboptimal bowel cleansing reduces (i) the speed of colonoscopy, (ii) the cecal intubation rate, and (iii) the number of polyps detected . It also increases costs, mostly due to repeated procedures. These problems are a source of frustration for both the patient and the endoscopist on a daily basis, as excellent bowel preparation is obtained in only 30 % – 40 % of patients . The quality of bowel cleansing has remained suboptimal even though numerous different products and regimens have been tested and compared in no fewer than six meta-analyses. Therefore, a completely different approach to improve precolonoscopy bowel cleansing is welcome. This double-blind randomized controlled trial (RCT) examined whether an educational booklet would allow patients to achieve better bowel preparation for colonoscopy . The study included two phases: (i) development of an educational booklet, which was produced with extraordinary care, and (ii) comparison of the quality of bowel cleansing between patients who had received the booklet by mail and those who had not. In the first study phase, the authors conducted interviews with patients (on the day of colonoscopy before the procedure) and with healthcare providers with the help of “a psychometrician and health literacy expert.” The draft version of the booklet was modified based on feedback from a sample of 60 patients. The final version of the booklet contained 20 pages, and included pictures of food and liquid that were permitted or prohibited during bowel preparation, a visual color scale for interpreting stool effluent color and transparency, answers to frequently asked questions, and a checklist for the patient. The language did not exceed a sixth grade level. In the second study phase, 436 patients were randomized to receive either the usual care instructions or the booklet by mail 1 week before their scheduled colonoscopy. Bowel preparation quality was the single trial endpoint. It was assessed by two raters using the validated Ottawa scoring system and anonymized representative photographs of each bowel segment (primary endpoint) as well as by the endoscopist using a Likert scale immediately after colonoscopy (secondary endpoint). The intention-to-treat analysis included those patients who effectively underwent colonoscopy at the scheduled date (n = 266, 61 %); the per-protocol analysis further excluded 29 of 132 patients (22 %) in the booklet arm who reported having not received the booklet by mail. For the primary outcome, the mean Ottawa score was higher for the booklet arm vs. controls both in intention-to-treat and per-protocol analyses (P = 0.03 and P = 0.005, respectively). For the secondary outcome, the proportion of patients with a bowel preparation rated as good or excellent by the endoscopist immediately after colonoscopy was higher for the booklet arm vs. controls, both in the intention-to-treat analysis (68 % vs. 46 %, respectively; P = 0.054) and in the per-protocol analysis (76 % vs. 46 %, respectively; P = 0.006). The authors calculated that there was one additional “good” or “excellent” bowel preparation for every 4.5 booklets sent out (intention-to-treat analysis). Such an increase in score is clinically significant because good bowel preparation was associated with a significantly higher polyp detection rate in a previous report by these authors. Study limitations included (i) the involvement of ambulatory patients exclusively (inadequate preparation is less frequent for ambulatory than for in-hospital patients) ; (ii) the use of three different purgative solutions administered in a single dose on the day preceding colonoscopy; (iii) exclusion of patients with cognitive impairment, although the authors did not explain how they determined whether patients had cognitive impairment before sending the instructions by mail; (iv) borderline statistical significance in the intention-to-treat analysis of the endoscopist’s assessment of bowel cleansing. 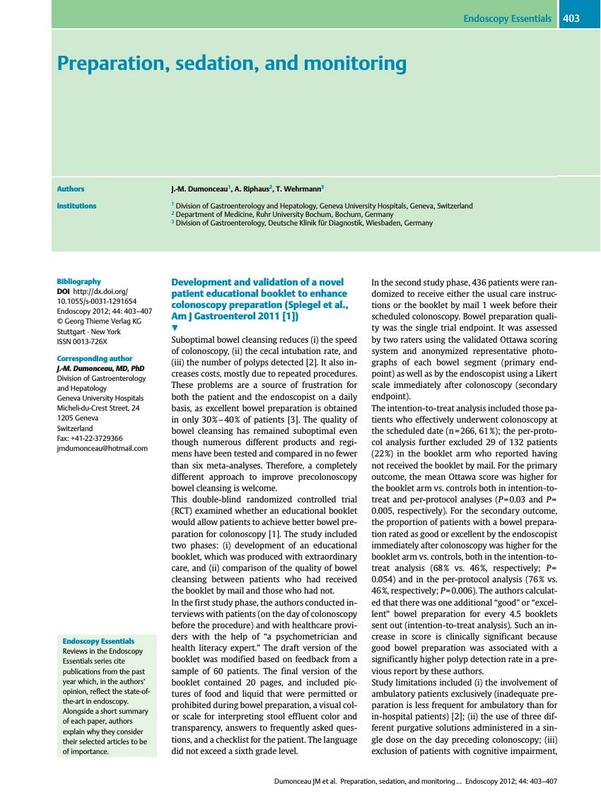 Only the intention-to-treat analysis should be considered in this RCT because it is likely that the patients who reported that they had not received the booklet indeed discarded it (these patients received instructions for bowel preparation and the booklet by a unique mail). This accounted for 22 % of the 132 patients in the booklet arm and these patients were excluded from the per-protocol analysis. Despite these limitations, this study is interesting because it offers a new approach to improving bowel preparation, and presumably quality and cost-effectiveness of colonoscopy. The authors provide an updated version of the booklet for split regimens of bowel cleansing in the Appendix to the article. 10 Riphaus A, Macias-Gomez C, Devière J et al. Propofol, the preferred sedation for screening colonoscopy, is underused. Results of an international survey. Dig Liver Dis 2012; 44 (in press) DOI: DOI: 10.1016/j.dld.2011.10.019.